Being a single parent is not easy, but you needn’t think that you will be a failure at raising great children. With Raising Great Kids on Your Own: A Guide and Companion for Every Single Parent by David Frisbie and Lisa Frisbie you will soon realize that it is possible to be a successful single parent. For Christian parents looking to raise their children as God would have them do, this single parenting book can serve as the perfect guideline to achieving this efficiently and reliably. One of the ways in which this book will help you in your attempts to become a great single parent is by teaching you how to nourish your own soul by keeping your life and goals focused on God. After reading this book you will also find it easier to maintain those important ties with friends and family and keep your faith in the right place. Secondly you will be given all the skills you need in order to help you kids get through a tough time, such as a divorce. You will be taught how to empower your children and to nurture them effectively through this difficult time. As a single parent you will suddenly find yourself in a position where you will be forced to deal with situations and problems outside of your normal comfort zone. In Raising Great Kids on Your Own, you will be taught the skills you need in order to achieve this effectively. This is one of the biggest adjustments to becoming a single parent and not everyone is able to deal with it on their own. A book like this one will make it that much easier to get through this difficult time. As a single parent the responsibility lies completely on your shoulders to make sure that your children have a great future. No one else is going to ensure that your children’s future is secure. This is a lot of pressure to place on one person, but the resources provided in Raising Great Kids on Your Own will teach you how to build a great future not only for your children, but also for you. 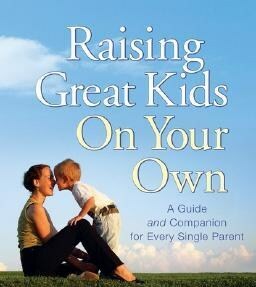 Why read Raising Great Kids on Your Own: A Guide and Companion for Every Single Parent? There are several advantages to reading this book. The authors of this book are speaking from a position of great knowledge. They have traveled extensively and are devoted to counseling in this domain, which means that they have built up huge reserves of knowledge on the subject. Many people have successfully used this book to help them through this tough transition, and it comes highly recommended.